It’s worth trying each pair of pants on, but there’s also one person who might have special insight on this matter. Matt Cain. The Cardinals thing is just weird. Take his two starts against them out of his line this year, and he’s got an 4.04 ERA and a couple bad starts in hitter’s havens (Milwaukee and Colorado). Pitcher vs. team stats are iffy over long hauls, but last year the Cardinals scored nine runs in 11.2 regular season innings, and this year’s team is similar in structure. Still, over his entire career, Cain has had a 3.37 ERA and 1.18 WHIP, and against the Cardinals, in 57 innings, he’s had a 6.63 ERA and a 1.49 WHIP. Other than the Brewers (and their park) and a few American League teams he’s seen once or twice, the Cardinals are his bane. His successes against them pale in comparison to the troubles he’s had against the team. Because it’s gone on his whole career, it’s hard to blame any one thing that’s happening right now. Sure, Bengie Molina joined the Cardinals’ coaching staff. And Mike Matheny is their manager. Neither was there in 2008 when the Cards ran a nine spot up on him in 3.2 innings. If this recent outburst is due to some sign-stealage, we’d have a heck of a time proving it. That’s often done by the baserunners, who aren’t on television when they are attempting to convey the next pitch to the batter. 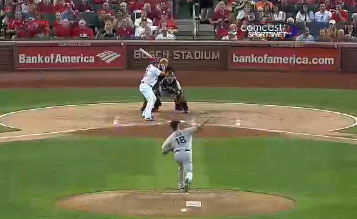 Watch video closely and it seems impossible that Cain is tipping his pitches with runners on. He’s very simple from the stretch, and the glove doesn’t look like it moves when he searches for his grip. But his numbers from the stretch this year are much worse than the league average, and his own average, at least as far as we can tell. Using ‘runners on’ as a proxy, we can see on Baseball-Reference.com that he’s normally had a .674 OPS against with runners on (slightly better than the league average of .737). This year, batters have a 1.079 OPS against him from the stretch. It could be a small sample thing, or it could be mechanical. 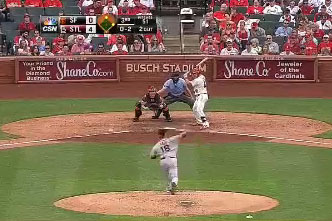 Former major leaguer Mauro Gozzo taught Matt Cain his basic mechanics way back when the Giants’ ace was growing up in Tennessee, and he preached to Cain that he should “stay back and balanced.” The pitcher needs to make sure he’s set and has his balance at his release point. Things get a little tougher when you try to look at it in real life. Here are moving pictures, both against the Cardinals, both out of the stretch. 2012 on the left and 2013 on the right. Maybe he’s a little out in front this year? Maybe? 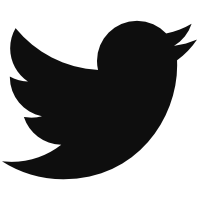 This might mean something. 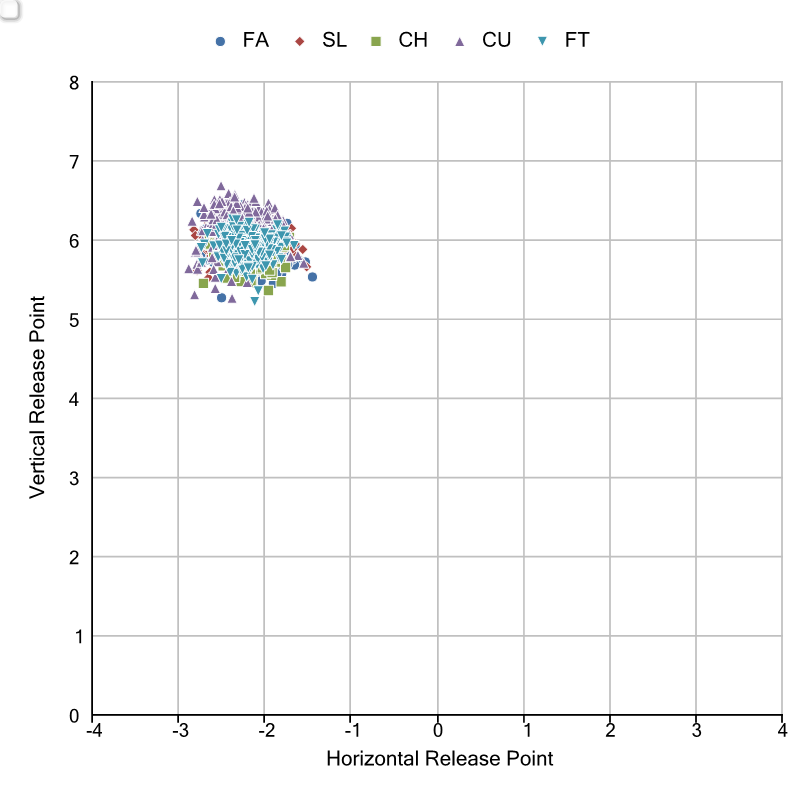 Cain is hitting the edge of the strike zone less, and he’s hitting the heart of the strike zone more. Too many balls drifting into the heart of the zone means one thing: “It seems like my mistakes are all getting hit for homers,” Cain said. And after a career showing a 7.1% home-run-per-fly-ball-rate, Cain’s right: 15.1% of his fly balls are now homers. Not all homers are alike. HitTrackerOnline has a designation for home runs that did “Just Enough” and wouldn’t be dingers in all parks. Of the 1760 home runs that have been hit this year, 609 have been Just Enoughs (34.6%). 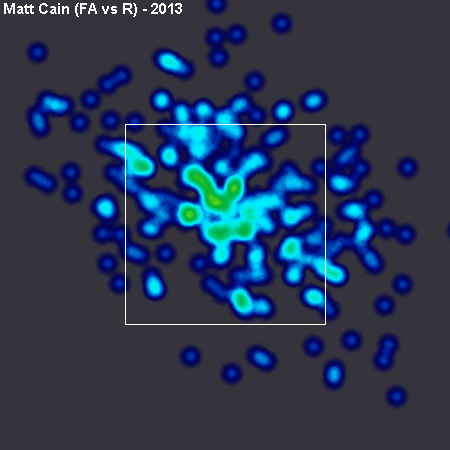 Of the 13 home runs Matt Cain has given up this year, four have been Just Enoughs (30.1%). Cain is tied for 19th on the list of Just Enoughs, but that’s probably since he’s given up a lot of home runs. His percentage is less than the league percentage. League average for pop-up percentage is 3.8% this year, so even regressing back to league average would help Cain. Even better would be regressing back to his career average (5.2%). And since he’s shown this skill so steadily his whole career (enough that hitters like Votto have noticed, too) it’s probably a good idea to bet that Cain will once again show this skill this season. Maybe Cain should actually pitch higher in the zone, get his fly ball rate up to where it normally sits (this year he’s allowing the second-fewest fly balls of his career), and take the infield fly balls that come with that change? Matt Cain’s velocity, pitching mix and swinging strike, walk, strikeout and ground-ball rates are all virtually identical to his career rates, so it’s tempting to say that nothing is different. And yet, Matt Cain is making mistakes. Since he’s always around the zone, they are hittable mistakes. And now that they are closer to the heart of the zone, they are being hit harder than they’ve ever been hit. Ask the crowd, and there are a million theories. Ask the pitcher, and it’s just about making mistakes. Ask the numbers, and they say that yes, he’s missing his spots, but that his career still suggests he can right the ship. Maybe tweaking his release point and working his balance at that moment will be the spark that ignites the regression back to his career mean. We hoped you liked reading Why Is Matt Cain Struggling by Eno Sarris! Great analysis. Did ya ask Cain about the Cardinals thing? Or is that one of those questions that can’t be phrased right. That was pointed out to me after I talked to Cain.